This original range of kitchen tools by Kuhn Rikon reflect all that's best in Swiss design and engineering knowledge. Classic can opener. 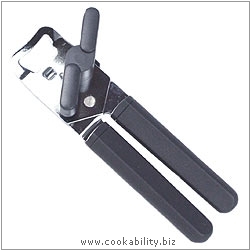 Stainless steel mechanism with integral crown top opener and black polypropylene handles.